Monitoring of sea urchins in Port Philip Bay over a 4-year period has revealed that booming urchin populations and the barren grounds they created by overgrazing kelp beds are likely to persist in the long term unless drastic action is taken. High density populations of the Australian urchin Heliocidaris erythrogramma have been monitored in Port Phillip Bay since 2009 by University of Tasmania and Reef Life Survey divers, after first being documented in the 1980s. 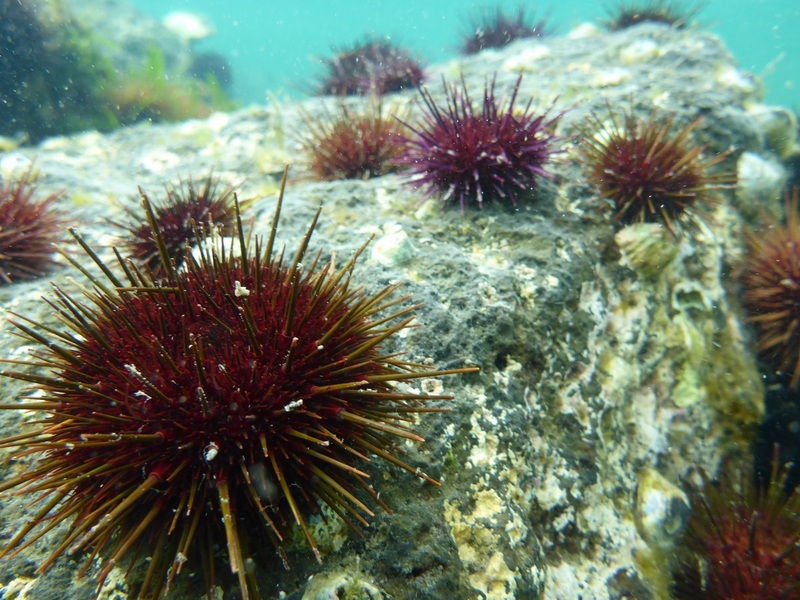 New research led by IMAS researcher Dr Scott Ling, published in the journal Ecology, studied urchin growth and population dynamics at five sites in distinct regions of the bay and found the urchins have the potential for further future population growth and destruction of kelp beds. Dr Ling said that while most species would suffer population collapse if they over-consume their main food source, urchins adapt so they can continue to thrive. “Urchin populations are able to persist even after they’ve devastated kelp beds and created underwater deserts known as barren grounds, locking-in the barrens for the long term,” Dr Ling said. “Far from eating themselves out of house and home, once kelp beds have collapsed urchins switch their diet to drifting kelp filaments and algae on rocks. “Our research in Port Phillip Bay found that high urchin populations persist across western and northern parts of the bay, with densities of up to 600 000 per hectare in some areas, the highest known urchin densities in Australia. “Far from undergoing population collapse, they are so stable and well-established that they can now be considered the ‘new normal’. “Urchins on the bay’s barren reefs have reduced body-condition and growth, shorter longevity (of about six years), and are more prone to disease. Dr Ling said more than 60 per cent of the bay’s reefs were already urchin barrens when the study began in 2012, and barrens are particularly difficult to restore. “While it takes many urchins to create a barren they can be maintained by relatively few, and the rate of juvenile recruitment on established barrens is high. “To restore kelp beds almost all of the urchins need to be removed on a broad scale, as culling just large urchins in localised barrens, for example, simply leads to faster recruitment and growth of juvenile urchins. “Quicklime is currently being used in Norway to cull urchins across all size ranges and we are also exploring this approach on extensive barren grounds in Tasmania, where an estimated 18-million invasive sea urchins have created extensive barrens along the state’s East Coast. “With urchins, however, an ounce of prevention is better than a ton of cure. “The best time to control urchins is before urchin barrens are formed, with our research showing greater predation rates on urchins within kelp beds than on barren grounds across Port Phillip Bay. “The research findings on growth rates and age of the urchin also provide critical information in support of developing the urchin fishery in Port Phillip Bay, which can also be a way of keeping a lid on urchin population booms. “Kelp beds provide habitat for an array of urchin predators and there appears to be some resilience of persistent kelp beds to urchin overgrazing in Port Philip Bay. “However, voracious urchins predators such as large rock lobsters appear to have disappeared from the bay a long time ago,” Dr Ling said. The research was funded by the Victorian Department of Environment Land Water and Planning (DELWP), Australian Postgraduate Awards, Holsworth Wildlife Endowments, and the Australian Research Council.